Cool Tools I Use: SPOT on! 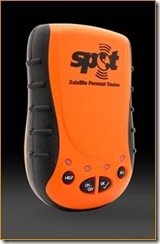 This SPOT messenger system is one of my newer "can't live without" tools and a "mashup" of hardware and software technologies, namely GPS, satellite-based communications, realtime mapping, and more. It is also an example of the kind of "advanced" functionality that is quickly moving out of the hands of experts and high budget projects or pure luxury objects into the consumer mainstream. This is a trend we are seeing much more of these days, and is one I see escalating exponentially in the years ahead. Look, look! See SPOT run! SPOT is a great example of the power of simple purpose combined with simple design. It essentially does ONE thing very well: tells anyone you choose to know precisely where it (and you!) is on the planet with the push of a single button. 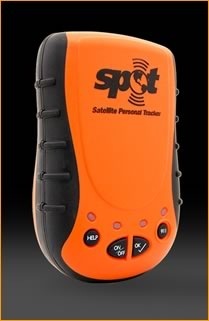 It uses GPS to precisely calculate where it is when you push the "check" button, and transmits the latitude and longitude coordinates via the worldwide (almost) GlobalStar to a list of people (text message or e-mail) that you give it and to a website-based map. It costs less than US$150 along with an annual subscription of about $90. For people like myself who are regularly in very remote and varied locations, and involved in possibly life-threatening or risky situations, this is a no-brainer purchase. Simplicity is one of the things that makes this such a marvel for me and why it's made my list of Cool Tools to share with you. Designing for simplicity is in fact very difficult, and it seems a bit of a lost art these days, although it one I believe and hope is making a comeback. The SPOT device itself is relatively small (about the size of slightly rotund older cell phone), and while I sometimes wish it were smaller, I must admit that I lose smaller things much more easily, and this device is not cumbersome. But if you were wearing it on your belt or carrying in your purse, it would be nice if it were smaller. I suspect that the size is mostly due to the lithium battery (replaceable), which is probably more suitable for safety in high risk safety situations. It need to be very dependable and must last for a long time (years vs. days or weeks). Getting a "sorry low battery" warning is NOT something you want to see if you are using this. Continuing with the simplicity theme... there are no wires, no plug-ins, no attachments, no protrusions (such as antenna), and it has a VERY simple interface consisting of only four buttons: on/off, OK (CheckIn), 911, and HELP, with a red/green indicator light for each one. If you think you or others you know and love might have a good use for this device, you can read more on the SPOT website, but here is the quick overview to help you see just why I think this is such a Cool Tool for me and perhaps for you. √ Check in: When I push the "Check In" button on SPOT it sends a short message with my exact latitude and longitude information via satellite to a list of people I have provided. Being satellite-based means this will go out independent of any phone or radio systems anywhere on the planet. * It can take up to about 2 minutes for the message to go out via satellite, BUT it will go out as long as it has a clear view of the sky, which can be through windows, but not through steel or other physical obstructions. Of course, this is not a major limitation, since its primary use is for outdoor activities. However, I've had it work well even inside buildings as long as it is placed in an outside-facing window. 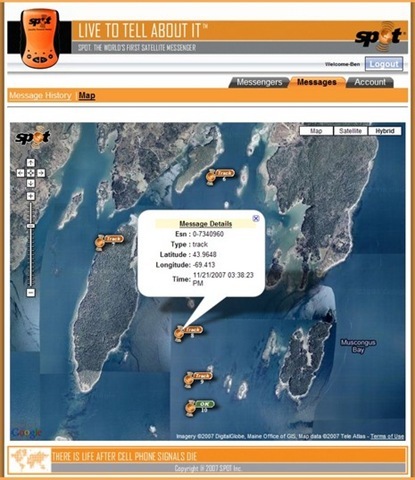 * This is not completely true as SPOT uses the GlobalStar satelite system and they do not quite have true planetary coverage, since there is a "hole" over the Pacific ocean. Other than for those living in such remote locations and blue water sailing types such as myself, this is not much of a problem and will hopefully be resolved later this year or next when and if GlobalStar adds another satellite to their system. These messages include both a short bit of pre-set text I can provide such as "Hi, this is Wayne reporting to you with my current location" and the lat/long coordinates at the time I pressed the button. As part of the setup, I go the website and put in the mobile phone numbers (for text messages) or the e-mail addresses of the people I want to receive these messages. Thereafter, every time I press the √ CheckIn button, all of these people get this short message with my updated location. Simple, handy, powerful. Having used this for the past few months while I've been out sailing, I've also come to appreciate that this lets everyone who cares not only know where I am, but also that I'm OK since I have had to consciously press the √ CheckIn button. Track Progress: The SPOT also has an automated position reporting option that they call "SPOTcasting" and I use this a great deal. When it's turned on (by simply holding down the √ CheckIn button for 5 seconds), SPOT automatically transmits my lat/long coordinates every 10 minutes for the next 24 hours to a web server. Of course, it would be rather obnoxious to have these going to people's mobile phones or e-mail inboxes, so instead, these "SPOTcasting" messages are just stored on a server and are accessible to me as either a historical log, or as a set of points displayed on a map that I can share with anyone. Initially, I could only provide access to people by giving them my login information and password for the site, but a few weeks ago they finally added my #1 wishlist request, which is the ability to create and share a web page that displays all my check and track points "live" on an interactive map like this. 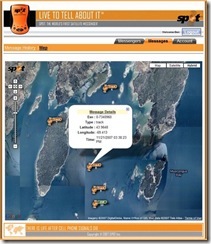 By combining or "mashing up" an interactive online map (Google maps) with a feed of my check points and/or track points as they are broadcast from my SPOT via satellite messages to this server page, I am able to provide access to the complete history of my travels and my current or last location to anyone with a browser. * I do my best to practice the experiential learning I'm so often expound on here, and real-world use is one of the key requirements and values I have for these Cool Tool posts. If you're interested in a real world example of the use of SPOT type technology ,you can follow this link to my personal travels of late. I'm writing this on June-4-2008 at about 14:07 UTC so I'll let you figure out where I was at that time. Ask for Help: I would press this one for non-life-threatening siuations. It is diffferent from the CheckIn message because it sends out a pre-programmed message to my contact list, telling them I need assistance and giving them my location data and a link to it on Google Maps. Alert 9-1-1: This, as you might expect, is for life-threatening situations, and it's the one you hope you never need! When pressed, this sends an alert to the Emergency Reponse Center and sends a distress signal. the appropriate responders at that location, such as police, Coast guard, country's embassy or consulate or other emergency response or search-and-rescue teams. It also notifies my emergency contact person(s), which I have provided when I initially set up the device. And that's it! Simple, easy, powerful. The SPOT is not for everyone, but this is part of what I had in mind for these Cool Tool posts—not a Top Ten list of what is most popular (there are lots of these for you already), and not just something shiny and new, but something very useful and valuable for the right person at the right time in the right context. We (both individually and as groups) are unique "snowflakes", as are our situations, and so these Cool Tools are aimed at helping all of us discover things that will match our unique needs or the needs of those around us, and share a part of the overall Snowflake Effect, which my great colleague Erik Duval speaks of and write about so often. Hope this SPOT satellite messenger is of value and interest to you. Name of the tool and source for getting one. How did you come to discover this? Why is it on your top ten "Cool Tools I Use" list? Serious Play: Are We Humans the Biggest Computer of All? Would you be interested in a future where the pursuit of fun and enjoyment was one our our major roles in life because it leads to solving extraordinarily large and complex world problems? For example, what if all of us helped to digitize all the content contained in all the books in the world? Almost none of this content is currently available on the Web or in any digital form and as such, is largely inaccessible to most. And would you be interested in a world where the relationship between computers and humans is a very positive and symbiotic one? I know I would. I'd like to bring your attention to some of the ways in which this is already happening. Let's see if this excites you so much that you'd like to not only participate in some of these processes, but also start to use some of these models to help solve some of the problems you and your profession or areas of interest face. In my previous posting "Moving aLOM", I mentioned some of the exciting, yet daunting, challenges of the future of metadata, such as how to create, in staggering volume, some of the more "subjective" metadata—things like the infinite characteristics that describe people, places, and things—where we humans are still the only source. This effort would include things like creating metadata for all the images and videos out there—still a largely unsolved problem—the absence of which not only makes them very hard to find, but also makes the Web and computers very inaccessible to the visually impaired, which, with age, might include a lot of us! Perhaps most notable in this area is a relatively young new professor at Carnegie Mellon University, Luis von Ahn, standing at right in this photo with his PhD advisor Manuel Blum. Luis has already completed some amazing work on what he refers to as "human computation" and how to put "wasted" human cycles to use in solving problems a computer cannot solve at this point in time, but humans can solve easily. Luis also picks up on a theme we have discussed here on Off Course - On Target in many other contexts—the power of the "network effect" achieved by connecting everything and every one together. Human computation is obviously focused on the latter, and Luis wants us to consider having all of our brains connected together as an extremely advanced large-scale distributive processing unit. Not to worry, no wires or direct connections to your head are required! 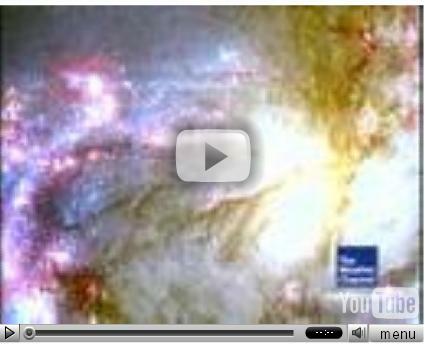 Before I go any further, and especially if you are more of a visual and auditory learner, let me recommend that you immediately watch this talk called "Human Computation" that Luis gave on July 26, 2006, about the power of human cycles. This 51-minute talk is part of the Google Video Text Talk series (also highly recommended), and while it is long by some current standards, I feel very comfortable recommending this to you, since I'm convinced you'll agree it was a VERY good use of your time (actually Luis' talk only runs 40 minutes, and is followed by about 10 minutes of a good Q&A session). 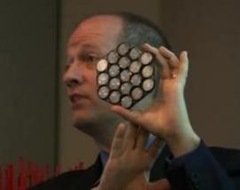 Another excellent reference for you, which contains more fascinating details and examples of von Ahn's work, can be found in Clive Thompson's article "For Certain Tasks, the Cortex Still Beats the CPU" in the June 2007 edition of Wired magazine. But for those who don't have the time right now to look at these things more, here is a quick synthesis of what I find so exciting and interesting about the innovative use of our human "compute cycles", and the use of "fun and games" for very significant and "serious" results. What von Ahn likes to call "games with a purpose". One of the most common and effective examples of this type of human computation is one of Luis' first applications, which is known as "Captcha". The name may be new to you, but I'm sure you're already a veteran Captcha expert! Captchas are those slightly difficult to make out words that you are asked to identify and type into a box when you are signing up for web sites. Captchas are used for responses online and in other situations where we want to prevent automated "bots" from generating unending amounts of "spam" or other undesirable exploitations of such online experiences. The problem is how to differentiate between a human response and a computer response, and Captchas are a simple solution to this problem, as well as a simple example of a problem that computers can't solve by themselves. In itself, this doesn't sound like that interesting of a problem, although certainly it is an annoying one! However, part of what I would see as Luis' brilliance is in the more primary problems he is solving with this process. In the case of Captcha, the real problem being solved pertains to my initial reference about the challenge of digitizing all the content of the world's printed matter, such as books. For more background on this digitizing and scanning challenge, you may want to refer to my previous posting from Jan 2007 "Books—the NEW old medium". Specifically, the problem is with all the words found in printed matter that scanning and conversion technology cannot make out, because the medium has a crease running through it, or it is partly missing, or other factors which make it impossible for the technology to recognize the words correctly. Yet, show these words to almost any one of us and we can easily recognize the word. So all those "fuzzy" words in Captchas are NOT just some random words that are blurred to fool a computer. Instead, these are the images of words which scanning technology has failed to recognize correctly! Luis refers to this specific application as ReCaptcha and you'll find much more information there, as well as instructions and free plugins for you to embed within your own sites, blogs, etc. And that's just one side of why Luis von Ahn was awarded one of the MacArthur "Genius" awards and a Microsoft Research grant, for he has also managed to put these types of solutions into a game format that starts to look at solving these kinds of problems at a scale that is truly breathtaking! Solving World Problems or Playing Solitaire? The building of the New York City Empire State building, which consumed about 7 million human-hours, and thus equates to just 6.8 hours of collective Solitaire playing. Building the entire Panama Canal, which took 20 million human-hours and amounts to less than a day of collective solitaire playing! Now imagine if we were able to put this kind of "human computation" to more effective use AND still do so within the format of games that people can enjoy doing themselves! One example is another one of Luis' creations, and one that has been running with staggering results for over three years called the ESP Game. As we've discussed many times, experiential "learning by doing" is often one of the best ways to learn about something new, so I'd encourage you to not only read about the ESP Game on that site, but to play it for awhile. (Caution: can be very addictive and time consuming!) When you do, you'll see how it puts two or more players (there is also a single player version) into a friendly competition by typing in descriptive words for a given photo (that metadata thing again), and they get points whenever they both type in the same word. So what? While progress is being made in image recognition technology, this is still largely a problem that computers cannot do. And ask yourself, do YOU take the time to "tag" or create all the metadata for the photos and videos that YOU post, such as who and what is in the photo? Didn't think so. 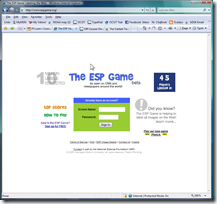 Yet by using this type of game format, the ESP Game has been running for over three years with no drop off in popularity and as of mid-2006, it was very fast, very cheap, and very accurate. If this were done as a popular online game site, it would be possible to label all the images on Google Image Search in just a few weeks! 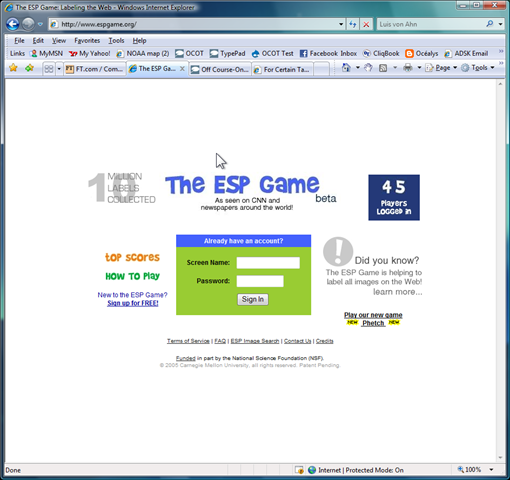 No surprise then that the ESP Game has already been licensed by Google in the form of the Google Image Labeler, and is used to improve the accuracy of the Google Image Search. We humans are relatively competitive animals and we like to do what we enjoy, so this approach appears to have a lot of promise. Yes, but WHERE is that object in the photo? Another problem that is even more challenging than identifying WHAT objects are in the image is identifying WHERE they are in the image. To do this, Luis has created another game called "PeekaBoom". The first player sees an image along with a word that describes an object within the image, and then clicks on the image where the named object is located. The second player sees only the object that the first player clicked on and types the word associated to that object. Once the second player guesses the correct word, the two players move on to the next image and switch roles. More details are explained in the video (you really should take the time to watch it!). Human Computer Relations: Parasitic or Symbiotic? "...humans solve some problems, computers solve others, and together we work to create a better world." Sound far fetched? Well, in the less than two years that his limited experiment of the ESP Game has run, over 75,000 players have come up with over 15 million "agreements" (matched words). This rate would indicate that 5,000 players playing simultaneously could label all images on Google Images in about two months. Think about that...5,000 is NOT a very big number when you consider the numbers on many gaming sites. Therefore, it should be possible to label all the images on the Web in a few months. Again, I strongly recommend that you check out the video to get not only more details, but to see just how accurate, pragmatic, and promising this approach is. For example, it turns out that the results of a game such as PeekaBoom can in turn be used to help train computers to recognize objects and their location. Turns out that one of the reasons that computers are not yet very good at this type of object recognition and automated metadata generation is that there is very little data and examples to use to "train" the computers on how to do it. By capturing the results of all the human play in location identification of objects within images, this data can then be used to train computers to do the same thing"—allowing us move on to new challenges... and more fun. I think you'll agree that this approach not only shows great promise in terms of solving some very large scale problems, but has some surprising and equally amazing "side effects", like how some people have used this to help them learn a language. This approach has spawned its own game called Babble, where two English-speaking players are shown a sentence in a foreign language that neither of them speak, and are presented with a list of possible meanings (in English) below each word. Players try to agree upon a set of English words that forms the most coherent sentence. The result is that this activity is surprisingly effective in translating foreign text into English without requiring anyone fluent in both languages. Think of the possibilities of this running at a larger scale! Another "side effect" of this approach is how many players have noted that they end up finding other people who think very much like them, and thus they have a great sense of "intimacy" and closeness with their counterparts who play these games. Therefore, many ask if they can find out who their anonymous competitors are to continue the conversation. At this point in time, all the game players are anonymous and no identities are revealed, but one could imagine this being used as a way to help discover other people "like you"—ones you'd want to meet and get to know better. Common Sense Isn't that Common; yet! Again, computers can not currently solve this kind of problem, and it is another an example of the need for massive amounts of metadata. Imagine if we started generating massive volumes of these "common sense facts" and they were readily available to all. More Competition = Less Carbon? Lest you should think this is just a "one man show" from Luis von Ahn, I want to point out that there are many others who have been developing, adopting, and adapting similar models. For example, "Carbonrally: Carbon Challenge", which you can learn more about from the Nov. 20th, 2007 Webware post "Carbonrally: My carbon footprint's smaller than yours" by Martin LaMonica, is an application that is showing some great promise for improving the reduction in greenhouse gas emissions or the "carbon footprint" of individuals and organizations alike. 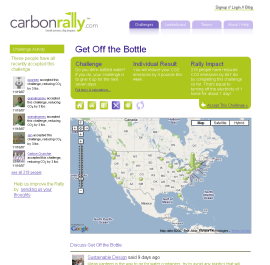 Carbonrally adds the dimension of some fun and healthy competition to do better than others. As Martin describes it, Carbonrally is "tapping into people's tribal competitive spirit". Whew! That's quite an introduction to what I believe is both a powerful and profound pattern emerging—where the natural pursuit of fun, healthy competition, and challenges are combined into a game-based model that has already shown some of the ways we can solve large-scale present and future problems. It also creates a whole new relationship between us and technology. This model is not only interesting and fun, but it is a fascinating example of "user generated metadata", which I mentioned in my previous "Moving aLOM" posting. Besides raising your awareness about "human computation" and the power of this approach, I also want to encourage all of us to put more time and energy into figuring out how we can inject more fun into work and other problem-solving situations. As you do so, I think you'll see an important job or task or problem can be more fun if it's solved with some kind of game play, and where the solution remains very much a human one. We can not, for now at least, expect computers to come up with such fun and game-based solutions by themselves! For starters, if you have websites or other applications where you have problems preventing spam or other misuses, consider taking advantage of some of the freely available plugins and nullities, such as those from the ReCaptcha site. Longer term though, please put some thought into which problems you could address with this model, and the ways you could do so by injecting the fun and challenge of a game-based approach into the more serious problems you need to solve...then share them with us here at Off Course - On Target. "The opposite of play is not work; its depression!" And I look forward to hearing all the innovative and creative ways you will come up with to solve problems—large and small—and replace depression with play. Have fun! Losing the ability to distinguish between what is real and what is unreal. Losing the ability to distinguish between originals and copies, real and synthetic, real and unreal, real and virtual, here and not here. This trend includes such things as the so-called 3D web, virtual worlds, the Internet of Things, 3D scanning and printing, and 3D human/computer interactions and interfaces, to name but a few. Will there be any such thing as "unreal" in the future? Since I am fascinated with and fixated on this topic, I'm going to develop it as a theme. Perhaps we'll call it "Oh Really?" and pursue it much further over a long period of time here at Off Course - On Target (OCOT). I've previously written a few articles on this subject, such as Coming Soon to a Desktop Near you: Massive Amounts of 3D for the Masses and will cover this area more, but we'll also get into some of the many other aspects of the changing (let's hope!) 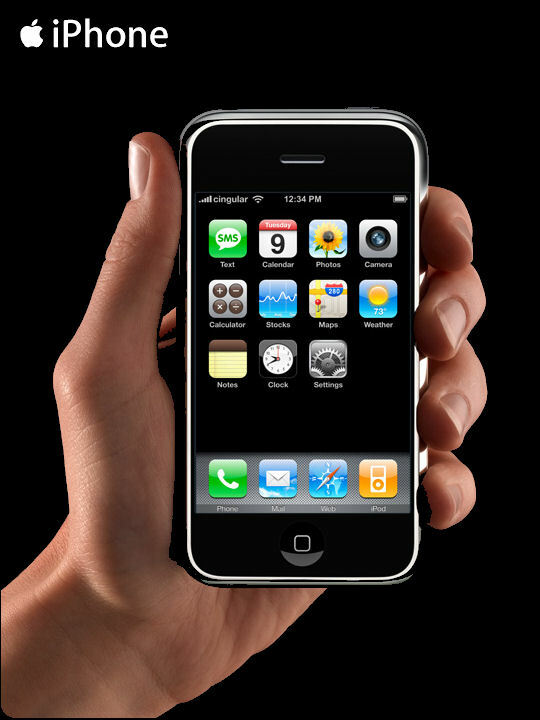 ways we interface and interact with technology and are making these much more "natural" and "real". For today, I want to briefly bring your attention to some exciting new developments coming out of Adobe Systems R&D work on new 3D camera lenses and some software they've developed for processing the resultant images. As you'll see, this technology opens up whole new possibilities, not just for photography, but for some amazing new ways of "playing with reality" by enabling you to go back into previously photographed scenes and change the images. Adobe is referring to this "computational photography" and as with many of the stories we cover here at OCOT, this one is interesting not only for the specific example, but especially for the larger topics and issues it reveals. Here's the story and it comes most appropriately from Dave Story, Vice President of Digital Imaging Product Development at Adobe, pictured here (thanks to Audioblog.fr) holding the original lens. For a quick overview of Adobe's research, you may want to start by checking out "Adobe shows off 3D camera tech" on Crave. This topic originates from a recent demo Adobe did in France showing their initial R&D work with a prototype camera lens consisting of 19 different lens elements that provided multiple views at slightly different angles and what Dave described as being a bit like what a multi-faceted insect's eye would see. Fortunately for us, Luc from Audioblog.fr was at the demo with his video camera and has put up this 10-minute video clip. When you first get to this site, you will also see that we still have a way to go with machine translation (in this case by Google), but bear with it and be sure to check out the video at the end to get the best understanding of what "computational photography" might lead to. Of course, the serious fun begins once the hardware and software can take over and use these multiple images and angles to enable some very new and different possibilities. For example, they are now able to dramatically extend the concept and functionality of a "brush" in terms of what you can do with a "virtual brush" when working on photo images. In the video (and this screenshot from it) you can see Dave Story use what he calls a "focus/unfocus brush" to go into a photo and shift the focus from one statue to another in the photo. He goes on to suggest that they can also create a "3D healing brush" that would enable you to, for example, get rid of an obstruction in the original photo. You will also see how they are able to move the "camera" after the photo has been taken. The movement in this case is very slight, but this idea of being able to capture moments and then go back and manipulate them AFTER the FACT is one of those possibilities which are equally and concurrently frightening and exciting. Something very powerful is going on here. Take this out quite a bit further and consider the potential when we have a full set of 3D data for every single pixel in digital images! Imagine the manipulation you could do to both still and moving images; think about how you could go back into a scene or a "captured moment" and look at things from different angles, perspectives and focus. We've already been seeing advances in video camera work on movies and in televised sporting events, where they are able to move the camera through a full 360 degrees and all six degrees of motion, but now imagine YOU being able to move and manipulate the imagery on your own AND AFTER the fact! Or consider the uproar that has already been happening around the 3D "maps" that Google, Microsoft, and others are creating by having 3D mapping trucks drive through an area (large cities for now), taking a complete set of digital and laser images of the entire area. These images are then stitched together, so you can go from a spot on a map to "being there", enabling you to look around from that spot and see a full 360 degree surround of what you'd see if you were "really" there. The concern, by the way, is over privacy (or lack thereof) , and of what would be captured by all these images, which are constantly being updated. Click on the "10 Market Street" listed in the left window (or anywhere in San Francisco for that matter). 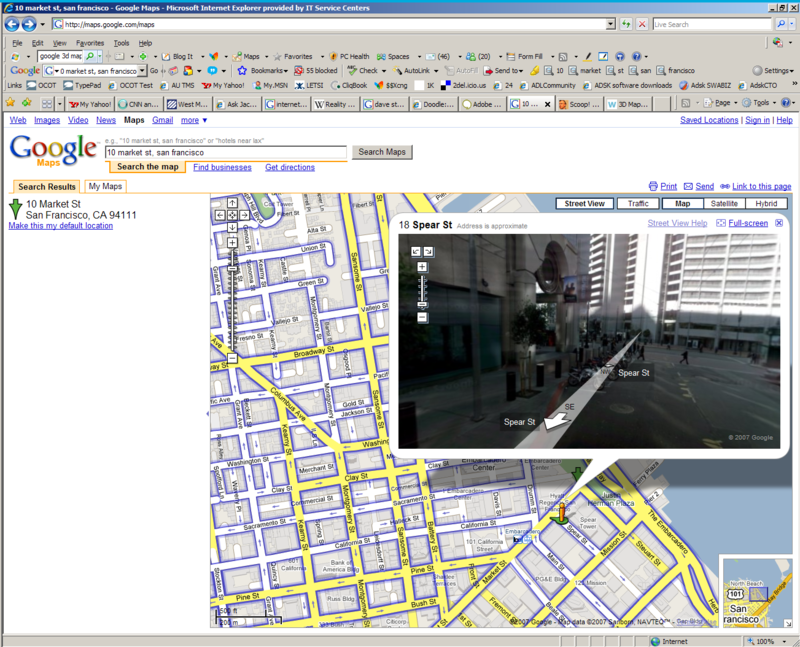 click on the "Street View" button on the top of the map area. Move the "little orange person" icon that shows up on the map to some intersection on the map. Move your cursor around in the street level photo image that appears to look around. Move your orange person icon up or down the street to look around there. Scary? Exciting? Make you think about more possibilities if this is just rev 1.0?? YES! And we think we have problems now (and we do) with not being able to tell the difference between an "original" photo, and one that has been altered! Just imagine the degree to which this technology scales those problems exponentially! Apropos to our larger theme here of full 3D reality and blurring the distinction between what is real and what is not, you can easily see how this recent example of "computational photography" is taking us in that direction and dramatically transforming what were previously just 2D photos, maps, and images. "Computational photography is the future of photography," Story said. "The more things we can do that are impossible to do in a camera, the more powerful people's ability to express themselves becomes." Quite true, and so once again, the great question that arises from such exciting new technology developments is what will you, and we collectively, DO with such newfound capabilities? And what might we want to agree NOT to do? What uses can you think of applying this to? What problems can you now resolve with this? I hope you will enjoy our foray into the world of 3D and the new reality, which of course is really just a matter of us finally having technology and ourselves catching up to the world as it's always been; VERY real and very multidimensional. Oh Really? del.icio.us tags: computational photography, Adobe, Dave Story, reality, real, unreal, photography, 3D mapping, 3D, 3D lenses, Oh Really? Technorati tags: computational photography, Adobe, Dave Story, reality, real, unreal, photography, 3D mapping, 3D, 3D lenses, Oh Really? New Perspectives: The Benefits of Looking Up! Alan Kay (sometimes referred to as the father of the PC, object oriented code, and much more) is credited with saying that "point of view is worth 80 IQ points". This is a catchy way of saying that consciously looking at problems and situations from multiple perspectives and constantly looking for new perspectives to solve problems is an extremely powerful technique and skill to develop. I suspect that you have many examples in your own life, where you've come up with solutions or have been more creative in your problem solving using some version of this idea. This idea of helping others, as well as myself, to discover and utilize new perspectives is a strategy I use in most of my work, and is a primary goal for Off Course - On Target. So with this in mind, let's see if we can get a bit "smarter" by finding and using a few new perspectives. We humans have a natural tendency to look ahead and down much more than we look up. It was always a successful strategy as a child playing hide and seek to climb up a tree or onto a top shelf in a closet. And anyone unfortunate enough to have spent time in a hospital bed or on a gurney knows how different the world looks from this perspective and how little attention is paid to ceilings! On the other hand I've noticed that dentists have taken notice and are putting things on the ceilings, such as paintings or televisions, for you to look at while you are reclining in the dentist's chair. Based on my brief time with this new feature I see this as fun and functional. How well did your school science courses help YOU understand the spatial relationships of the moon, earth, sun, and stars? How well can you point out the different stars and constellations in the night sky to your children or others, explaining why they change depending on date and your location? Sky sure seems to help me a lot with this. To continue with your experiential learning, something we are so fond of here at Off Course - On Target, I highly recommend that you download the newest version of Google Earth and take the Sky feature out for a spin. I think you too will find that it offers some serious fun and lots of learning as well. And while you're up in the Sky, why not fly? In some recent posts, I emphasized the need to avoid what I've characterized as "flapping", that is, copying experts and models of the past, and instead have urged you to focus on the essential characteristics you are seeking to take off and fly. So it struck me as a nice bit of serendipity to read of the recent discovery of a hidden flight simulator in Google Earth. These secret capabilities, referred to as "Easter eggs" are a favorite of some application developers. Adding motion is a great way to gain a new perspective, so strap yourself into one of the two airplane options, an F16 Viper and the more manageable SR22 4 seater, and try flying your way over your home region or anyplace else in the world you'd like to see. 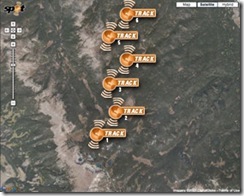 To access the hidden feature, open Google Earth and hit Command+Option+A (must be capital A) or Ctrl+Alt+A. Here is a full list of the keyboard controls for the Google Earth flight simulator. Fasten your seatbelt low and tight and welcome aboard! BTW, as you are flying around see how much the realism that comes from flying over photographic images of the "real" earth and sea starts to address some of the limitations of your experiences with less accurate virtual worlds that we've also mentioned in previous discussions, such as in my posting Virtual Lift Off? Another way to use new perspectives is to find ways to tie two or more of them together. For example, how can the benefits of looking up at the stars, help us when we are down on earth looking out and around us? Well, consider sailors who venture out into the open ocean and how extremely dependent they become upon knowing their precise location. This, of course, helps us just as much with navigation on land. Many of you have experienced the benefits (and aggravations) of onboard GPS and navigation systems installed in new cars you may own or rent. 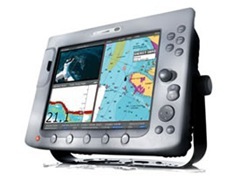 While modern day technologies, such as GPS and electronic charting, look after navigation with unprecedented ease and extraordinary accuracy, you always want to have a backup or two or three when your life depends upon it! Therefore, the ancient method of celestial navigation is still used as a backup by most who sail the open oceans. As an aspiring global sailor myself, I'm busy learning as much as I can about this art and science of finding your way by the sun, moon, stars, and planets, and I'm acquiring skills with sextants and the like. You can just imagine how much Google's Sky makes me "smarter" by helping me to learn these new concepts and skills. 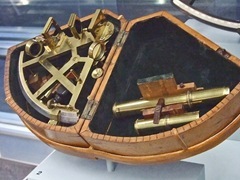 Besides, I just love the juxtaposition of setting my sextant, an 18th-century technology, down beside my oh-so-very 21st-century latest, greatest, high tech GPS system and digital charting screen. What examples do you have of using inverted thinking and new perspectives to help you learn more, and be more creative in your thinking and problem solving? Please share your examples through your comments here at Off Course - On Target or in your own postings and I'll continue to do the same. For the past few years, I’ve been talking about digital surfaces predominating our future, and my postings, “The Old Medium becomes the New Content” and “P-Learning: Fill up your Tank and your Head?” pointed out some good examples of this trend. So you can imagine how excited I was to see today’s announcement of Microsoft’s ventures in this direction and I’m particularly excited about the name they chose. It may not be a cool product name but it's hot stuff for me! At the "D: All Things Digital" conference on May 29th, Microsoft finally revealed a well-kept 5-year secret, code named “Milan”, and now unveiled as Microsoft Surface. This technology is part hardware and part software and some are referring to it as a “Table PC”. Read that term carefully—that’s TABLE as in “desk” and is not to be confused with the one with the extra "t", the Tablet PC, though it too may also benefit from this surface technology down the road. The hardware behind it is fairly straightforward, though a feat in itself, because it is a large multi-touch screen or display, typically about 30 inches in size, which is mounted horizontally, facing up like the surface of a small table. To have the imagery display directly on the touch screen required a combination of angled side projection and touch screen technology. Of course, hardware without software doesn’t do much. Add Microsoft Surface software into the equation, and things get really interesting. 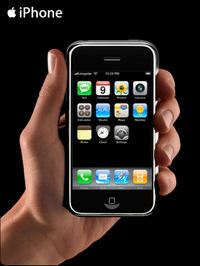 The software makes it into a full multi-touch display with lots of built-in features for gestures, recognition, etc. “Multi-touch” means that the screen responds to almost any number of simultaneous touches. You can do simple finger painting using up to all ten fingers at once, or perform more complex manipulations using multiple fingers on both hands, such as stretching out an image or window, or rearranging and moving windows around with your hands. You can also “pass” things that are on the screen over to someone else. Many individual users can physically fit around the “table”, interacting with the surface simultaneously. One additionally interesting fact is that Microsoft will produce both the hardware and the software, something they are already doing, for example, with the Xbox 360 and the Zune music player. The Microsoft Surface site has a full complement of videos, pictures and specs. ZDNet has a demonstration of Microsoft Surface and a Ziff Davis interview with the product marketing manager, Mark Folger. TechCrunch posted an announcement "Microsoft Announces Surface Computer". USA Today’s more detailed report “Table is Set for Computing” has some good examples of applications. ZDNet posted a background story on “How the ‘Milan’ table PC was born”. Even the New York Times got into it with multiple articles such as the one appropriately titled "Much Ado About Microsoft's Surface Computer"
And if you like that one, have a look at a similarly fascinating demo from Jeff that Fast Company posted called “Remapping the Universe”. Jeff has also recently started a company with the great name of “Perceptive Pixel” to help commercialize and develop his work, so let’s hope we’ll be seeing much more of this technology move from the lab to our tables. Fast Company also has a very good in-depth interview with Jeff called "Can't Touch This" that is recommended reading. Use some physical objects to perform tasks, such painting on the surface using a real paintbrush. Use gestures that are reasonably intuitive, such as the way you would normally work to rearrange things on a table (move them around, stack them), but with the added ability to shrink or expand them, or have them include movement, such as animations and video. If you’ve seen the movie Minority Report, you’ll have the basic idea, and the demos will show you more in a few minutes, so I’d recommend you watch them. Have physical objects “tagged” in several ways. For example, a “domino tag” can be attached or embedded into the physical objects, which are then recognized by the surface when you set them on it, and they can also communicate with the surface and computer to trigger further actions. This really starts to mix and mingle the physical “real world” with the digital virtual one. For example, you can read or recognize credit cards, loyalty cards, drink glasses, and paint brushes. Initially, Microsoft Surface technology is planned for use in businesses and high traffic areas, such as airports, cafes, and restaurants, casinos, etc., and comes with initial pricing to match—estimated at about US$10,000. However, we can expect that this technology will follow the same inevitable and rapid reduction in cost as other technologies, and will see equally rapid increases in performance. The upcoming Apple iPhone and the some of the new Tablet PC screens, such as the new IBM/Lenovo ThinkPad X60, also have multi-touch displays, and are designed for the mass market, so they will introduce more of us to this new type of interaction and interface. Therefore, NOW is the time for us to prepare and think about how we could utilize this type of technology in the workplace, the home, and the classroom. Think about using it to interact with maps. Imagine every desktop surface in your meeting rooms and classrooms having this ability. Imagine walls that are huge multi-touch surfaces! Rather than a computer on every desk, what if every desk were a computer? 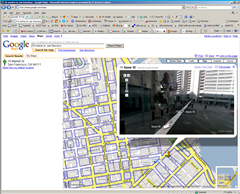 Add to this vision some other recent announcements, such as the new addition to Google Maps called “Street View”, which allows you to pick any spot on a map and get a fully immersive set of 3D images that you can control. Microsoft’s “Photosynth” technology takes a large collection of photos of a place or an object, analyzes them for similarities, and displays them in a reconstructed three-dimensional space. Imagine working with these on a tabletop surface that you, your friends, family, students and co-workers are sitting around and can now interact with, rearrange, zoom in on, and explore together. I’m particularly interested in the area of human computer interaction, and specifically, bringing our human “action” (such as that of our hands) much closer to the action on the display. When you think about it, the gap is currently very wide, given our reliance on keyboards, mice, trackballs, and game pads. For this reason, I’m still a big fan of tablet PCs and believe they are still on track to hit a tipping point of popularity and ubiquity in the next few years. As mentioned above, the new ThinkPad X60 tablet PC's have an optional multi-touch screen, so the trajectory continues to be clear to me. With Microsoft Surface, our hands and our gestures are now right up against the display images, about as close as we’ve come so far to being one and the same. Next, we will break through the limitations of two-dimensional devices and begin to have three-dimensional representations and haptic (force) feedback so that we can feel the objects and models, and begin to sculpt “virtual clay” with our hands. As additional dimensions and senses (such as smell, texture, time, locations, and sound) are added to this equation, the whole computer interface issue will increasingly fade and eventually become transparent. Then we can focus on what we are doing and the results we are trying to achieve. We can use our abilities to visualize and express our ideas for others, to do “digital prototyping”, and experience things before they are “real”. Of course, ultimately we will continue to blur the distinction between what’s real and what’s virtual, and literally redefine what “real” even means. So here is another set of examples where powerful new things are equal parts exciting and frightening. However as I like to point out, WE are the decision makers in all this, and it is up to us to make sure that the future that “surfaces” is one we really want and like! High Resolution Imagery = High Definition Learning? I am a HUGE fan of public radio, and I listen to it whenever I can. In the US, public radio comes in the form of National Public Radio (NPR) and most countries have a similar form, as well as access to Public Radio International (PRI). Typically these stations are broadcast just about everywhere, so as you’re driving, you can usually pick them up better than most other stations. I find their content to be one of the last sources of balanced and informative broadcasting. The other day when I was driving in the US, I caught a news story on NPR about a fascinating new joint venture between Google and the United States Holocaust Memorial Museum (USHMM) called “Crisis in Darfur”. NPR is very good about posting their content, so you can read more about it and also listen to the original broadcast called “Google Sets Out to Map the Crisis in Darfur”. If you are a regular reader here at Off Course – On Target, you will recall some previous posts, such as “Mashed up Maps for the Masses” and “Snowflakes Galore at TechFest 2007”, where we looked at ways that maps are benefiting from new technology and techniques that make them highly customized and extremely rich with information. This new initiative between Google and USHMM adds another dimension and is a provocative application of mapping and high-resolution photographic imagery. I am interested in this not only for this specific situation but also as a chance to see if this form of “high definition learning” will be able to make more of a difference in moving people to action than previous efforts. Unfortunately, history has shown that simply making people aware of such atrocities has had almost no effect on stopping such acts. This project will assemble photographs, high resolution satellite imagery, data, and eye witness testimony, and use Google Earth technology to make this accessible to over 200 million people around the world who have downloaded the Google Earth software*. 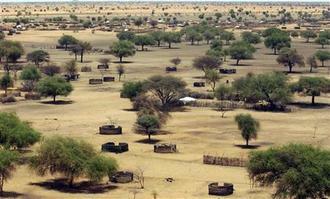 They will be able to zoom in on high-resolution imagery to see the destroyed villages and other evidence of the destruction that, to date, the Sudanese government has denied exists. * If you have not tried Google Earth or Microsoft’s Live Search (an implementation of their Virtual Earth technology) PLEASE do yourself and others around you a favor by trying it NOW! Google Earth does require a download, but this is truly one of those things you have to see and experience in order to believe and understand. Almost everyone I know who has done so has been completely amazed by its capabilities. And if it has been a while since you used it, you should try it as well, since new capabilities and more imagery and resolution is being added daily. To check out the Darfur imagery, you just need to “fly” and “zoom” your way over to this region (a good lesson in itself for the many who never knew Darfur existed or where it was on the map). You’ll see how the project has put a colored border around the region to catch your attention. Zooming in from there and exploring the area is what this project is all about, so give it a try. After these initial experiences, consider the profound impact that this readily available technology will have. We can expect to see a multiplier effect and an exponential increase in the volume of photographic data being produced by literally billions of lenses being aimed 24x7 at almost every place on earth. Keep in mind that this mapping technology not only includes the photographic images steadily streaming out of orbiting satellites, but also the billions of photographs that individuals like you and me are taking. All of us can contribute images from our digital cameras via web galleries from the likes of Flickr, Google’s Picasa, Kodak EasyShare, SmugMug and hundreds of others. Putting this in the context of maps and using location as an underlying interface and structure is proving to be a VERY powerful way of connecting information and intellect— truly creating new knowledge and learning. Of course, any powerful capability can be used for both good and bad purposes. However the point for us to remember is that the technology is “stupid” and can only be put to the uses and purposes that WE design and develop. So once again, we are both the problem and the solution. I am both hoping and asking that we make the right choice and take the action to ensure that this power is utilized and leveraged for very positive forward progress and benefits. It remains to be seen if the “Crisis in Darfur” project and this new combination of content and technology will produce new levels of deep and behavior changing learning. But in my opinion, it is a great form of leadership by example. Let’s learn from this example and begin to design and develop other ways of putting this technology to use for increased effectiveness of learning and performance. What other applications and projects can YOU think of for using this technology?